Seen here, a unique Rotor crank optimized for gravel riding, but what I talk about in this post is how the market as a whole will respond to the need for better crank designs for gravel bikes. Gravel-grinder, all-road, and adventure bike. Not without a certain controversy, these are all terms associated with a growing segment within the cycling industry. They’re selling a romance of riding long stretches of dirt paths that have yet to lose their frontier flavour….or perhaps its retracing the crumbling and forgotten roads of a previous century. If consumers want to write long, meandering love poems to crushed gravel, the cycling industry will sell them the quill. In general, these gravel bikes tend to be frames with somewhat relaxed angles and rider position, as well as generous tyre clearance . Cyclocross bikes fit that description to an extent, and indeed the first wave of gravel bikes offered by the big brands were little more than their stock CX bikes with wide-ratio cassettes. Since then, designers have lowered the bottom bracket heights for additional stability and added clearance for tyres bigger than what is allowed by UCI rules for cyclocross. Tyre manufacturers are now fully exploiting those changes by introducing a selection of tyres with low-profile treads, bigger on volume than a cyclocross 700Cx33 but smaller than what could be considered a 29er tyre. The next major development will be in the drivetrain, specifically the crankset and chainrings. Up until now, big brand product managers have spec’ed gravel bikes by putting on the widest cassettes available to dropbar shift systems, along with either a compact road crank, a CX crank, or possibly a mountainbike crankset. All of these combinations have their drawbacks, since none of them were optimized for gravel riding. A compact road crank with 50 and 34 tooth chainrings is perhaps a little too big for slower speeds sustained away from asphalt. A CX crankset may have a 46 tooth outer chainring, but with the same 110mm bolt-circle-diameter (bcd) of a compact road crank, it is still limited to an inner ring no smaller than 34 (in fact, CX cranksets are most often marketed with a 46/36 combination). And though mountainbike cranksets may have a smaller bolt circle diameter, they are most often being developed for either gnarly trail riding and/or huge diameter 29er wheels & tyres, so the chainrings are too small unless your concept of gravel adventure involves carrying enough stuff to camp out. In that case, maybe the XC mountain gearing would actually be suited to slogging across dirt, but that concept will never be more than a niche within a niche. Outside of offroad touring, what would be best is a chainring combination that has the 16 tooth difference of a compact road crank, but shifted from a 50/34 chainring set to down a 48/32, 46/30, or possibly a 44/28 combination. The problem is that the common 110mm bcd still limits the minimum size of chainring. With the debut of their gravel crank at this year’s Taipei Bike Show, Praxis has managed to cheat the 34 tooth lower limit by carefully clocking the position of the chainring bolts relative to the teeth of the ring, thereby allowing a 32 tooth inner ring without the chain hitting the chainring bolts. Arguably a clever work-around, but a little disappointing that they didn’t commit to a more versatile design solution that would open up the possibility of even smaller inner chainrings. Sugino did just that with their “Compact Plus” series of cranksets such as the OX801D and the less costly, non-polished OX601D, which I reviewed three years ago. The key aspect of the Sugino design is that 5-arm spider uses a 110mm bcd for the outer ring, but the inner chainring sits on a bcd of 74mm, which was once the most common bcd for the granny ring of triple cranksets. In many respects Compact Plus is a fantastically versatile design because it allows inner rings down to 26T, and it can even accommodate regular the typical 50/34 compact road chainring sets as well. Though the ramps and pins of Compact Plus outer rings are specially designed to work with the extra small inner rings, there is nothing particularly proprietary about the 5-bolt chainrings, which is just f***ing beautiful to the eyes of shop mechanics throughout the land. As of late Shimano, Campagnolo, and FSA are seemingly in competition to create as many possible unique chainring designs, often specific not just to the brand but also to individual crank models. The designers of course do this to enhance the perception of brand features, but ten years from now when end-users can’t find replacement chainrings, all that brand value is going to seem a lot less shiny. It’s a pity that Sugino’s design probably won’t catch on, but what wins in this industry really isn’t versatility and future serviceability. Success is largely determined by winning the battle for OEM, getting units on those thousands of bikes produced by the big bicycle brands. And now that the major bike companies have decided that gravel is really happening, they are going to be looking for OEM cranks that will give their product consumer appeal at an attractive price. And less obvious to the everyday cyclist, those cranks will need to be available in sufficient numbers and on time. 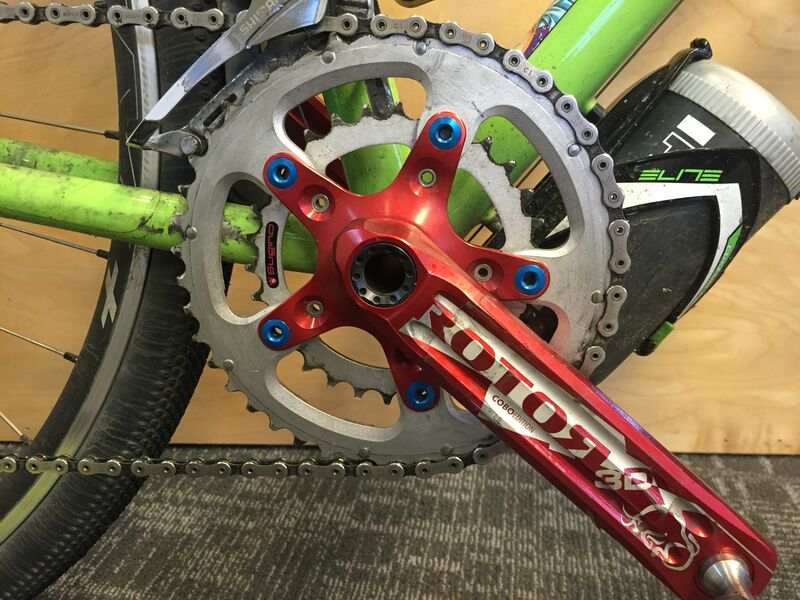 With manufacturing based in Japan and relatively small production capacity, Sugino just doesn’t have the ability to make cranks cheap enough and in the quantities necessary to sway the OEM market. It probably won’t be Shimano either because the industry’s giant has been slow to respond to new trends in drivetrain configurations for the last fifteen years. The precedent was established when FSA wormed their way into the road market in the early ’00s by leading the compact road crank trend with brilliant success while Shimano lost ground with triple cranksets. FSA might very well use the exact same playbook this time too. Also at this year’s Taipei Bike Show, FSA displayed multiple lines of gravel cranksets, including flagship K-Force and 2nd-tier SL-K versions. In those designs the inner ring bolts to the outer, which mounts directly to the carbon crank arm rather than a spider in a way that could be seen as a modern-day reincarnation of the TA Specialties Cyclotouriste crankset. Though this means yet more proprietary chainrings, that sin is at least partially mitigated by the svelte design and the fact that both cranks use the very versatile EVO386 bottom bracket/crank standard. The cranks will eventually be available in 48/32 and 46/30 chainring combinations. FSA also has several other models below SL-K that use a confusing variety of 4- or 5-arm spiders, some with different bolt-circle-diameters on the same spider; these are the cranks that will be on entry-to-mid-level production bikes. Of course, you won’t see any of these cranks for a while, some of it being 2018 product. By then, the gravel crank trend could go in an entirely different direction, and that really depends on what we see from SRAM. As a major manufacturer of shifting systems, SRAM can influence product managers in ways that FSA cannot, yet at the same time they have proven far quicker than Shimano to create and exploit new trends. SRAM has been a step and a half ahead of Shimano in MTB drivetrains for several seasons now, introducing 2×10 and later 1×11 with great success. Shimano has been distinctly on the back foot ever since SRAM introduced the narrow-wide chainring design (X-Sync, as they call it). The effect that the 1×11 concept has had on the mtb market has been profound; freed of the need to accommodate a front derailleur, frame designers have exploited the potential with changes in rear suspension and more tyre clearance. There’s already a bunch of mountainbikes in production as we speak that have no way of even mounting a front derailleur. It is very possible that big bike brands may decide that 1×11 is the way to go for gravel. On a gravel bike, a 40 tooth chainring combined with a 10-42T XD cassette gives a very similar overall range to a 46/30 crank with an 11-32T cassette, but with just a single chainring a frame designer could shape the chainstay to fit a larger volume tyre without lengthening the rear wheelbase. And it doesn’t matter if it’s gravel, fatbikes, 27.5+, 29er+, or even time trial bikes, the bigger tyre trend is hot across all market segments of the bike industry. If indeed 1×11 is embraced by the big bike manufacturers, Shimano will need at least three years to catch up. Granted, as an interim measure they could develop a rear derailleur to allow a dropbar lever to shuttle a chain across their new 11-46T HG cassette from their MTB groupsets. It’s plausible, but it just doesn’t seem like the way Shimano likes to do business. They’d rather really study the market and then develop a whole groupset as a solution…which is exactly why they’ve been lagging behind trends for a while. Shimano’s gestalt strategy keeps them as the apex predator of the road group market, but unlike road and triathlon bikes, greater drivetrain integration for gravel bikes will only go so far towards increasing consumer appeal. And anyways, the gravel bike niche is nowhere big enough for Shimano to commit that amount of resources. Meanwhile, if 1×11 becomes the dominant configuration for gravel bikes, the crank options could really open up similar to the mountainbike market. There is currently a whole gang of small manufacturers making chainrings to match popular bcd standards, as well as direct-fit versions to match cranksets such as SRAM, RaceFace, and others including potentially FSA. With the finely honed shifting provided by their multi-chainring crank designs made irrelevant, Shimano cranks would probably all but disappear from OEM spec in this scenario. The next two years of gravel bikes will be very interesting to see as the major players in the bike industry cue up new frame designs and components, but perhaps these trends could have an influence well beyond that demographic. Gravel bikes could take a big bite out of the entry-level road bike market as consumers forget about emulating fallen Tour de France heroes and dream of the kind of outdoor adventure that mountainbiking used to be before the sport became preoccupied with chairlifts, GoPro videos, and Red Bull. With the efficiency of dropbars, slightly more upright rider position, and rowdy capability of big volume tyres, gravel bikes could find easily find admirers among those who never leave urban roads. The beauty of the “gravel bike” is that it could become the do-all bike for a wide spectrum of consumers, and a crankset that is optimized for gravel might ironically be the most practical option for how the majority of riders use their bikes. I’m not saying that gravel could overtake fatbikes as the hottest trend in cycling, but then again who could have predicted that such a niche market would prompt manufacturers to brutally violate every component standard in the industry including inner tubes, bottom brackets, hubs, and even car racks and f***ing truing stands. Not everything that the bike industry does can be accurately predicted, but we should closely watch gravel bikes in the future.